This beautiful scarlet cup fungus is often found by morel hunters in the spring. 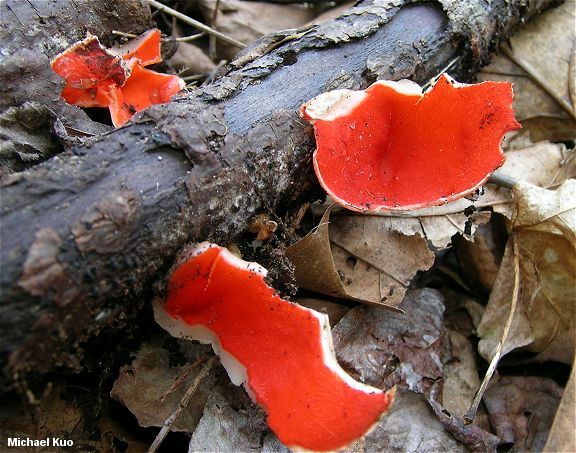 It is widely distributed in hardwood forests east of the Rocky Mountains, growing from rotting wood, and it provides an appealing contrast to the tans and browns of the springtime forest floor. 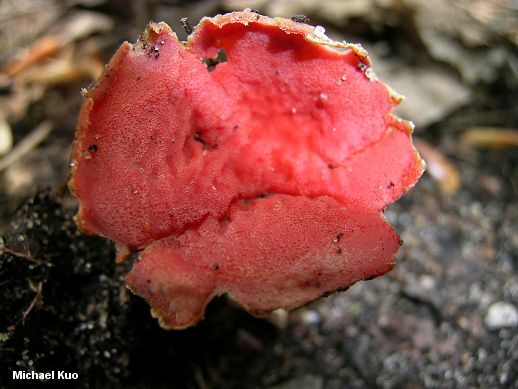 Field guides often treat this mushroom as "Sarcoscypha coccinea," though that species is actually found only in the Pacific Northwest. Sarcoscypha dudleyi and Sarcoscypha austriaca are the eastern North American species--but separating them, unfortunately, requires a microscope. See the gory details below, under "Microscopic Features." 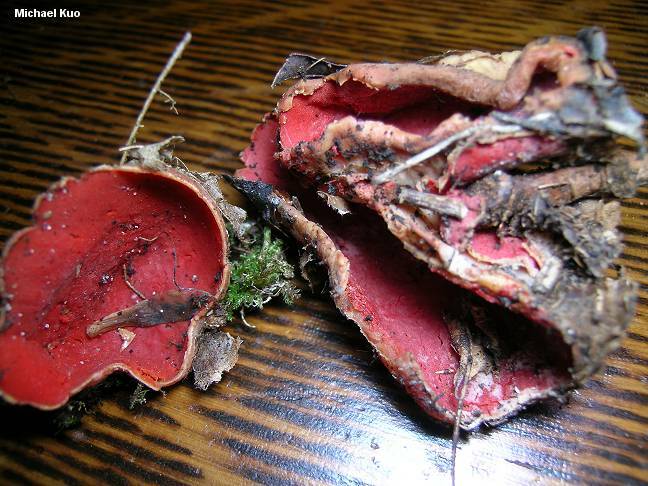 Fruiting Body: Cup shaped; 2 to 5 cm across; upper surface scarlet red, fading with age, smooth; under surface whitish to pinkish, with tiny hairs (use a hand lens); stem absent or rudimentary, up to 3 cm long, colored like and continuous with the sterile surface; flesh thin. 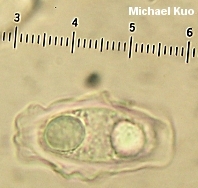 Microscopic Features: Spores 25-33 x 12-14 µ; ellipsoid, with rounded ends; typically with two fairly large (5-7 µ) oil droplets and many smaller ones; when fresh and viewed in a water mount, entirely sheathed. Asci 8-spored. Paraphyses filiform; with orangish red contents. 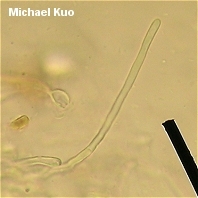 Excipular surface with hairs that are straight or only slightly curved, and are not twisted and intertwined. REFERENCES: (Peck, 1894) Baral, 1984. (Saccardo, 1895; Harrington, 1990; Baral, 2006.) Herb. Kuo 04239501, 05249703, 05230507, 05100601, 03100701.